Set/3 Fairy Garden Tools for Merriment Mini Fairy Gardening. Full Description: Every proper mini garden needs garden tools! 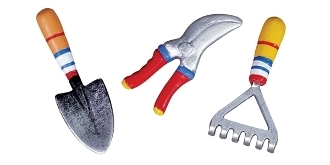 This set of three striped tools includes a mini trowel, cultivator, and pruning shears. Designed by Mary Engelbreit, these tools are made of resin and feature all-weather paint.